I finally got around to watching Indiana Jones & the Kingdom of the Crystal Skull. Contrary to some of the internet hubbub I'd heard when it was first released, I thought it wasn't too bad. Not a great movie, I don't think, but not bad. Certainly not in the "they raped my childhood" sense that some people have criticized of it. But what it did do was provide the opportunity to show me that, really, it's not you, it's me. Background... 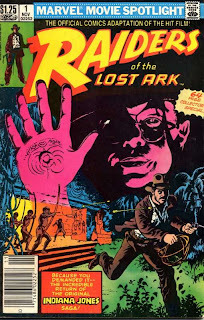 I saw Raiders of the Lost Ark when it first came out in theaters and loved it. I had the action figures and the Atari video game and the comic adaptation and a t-shirt I wore to shreds. I went out for Halloween one year as Indy. Great stuff. I also enjoyed Temple of Doom when it came out. Got the action figures, did a book report on the novelization of the movie in costume, etc. Then several years without anything new, my interest waned. I saw and enjoyed The Last Crusade when it came out, and it seemed like a good endcap for the license. A few years later, my dad got a review copy of Indiana Jones and the Fate of Atlantis and I played that, I think, the last summer break I had in college. A decent game, but it wasn't Harrison Ford. The Young Indiana Jones Chronicles came out around that time, too. I caught a couple episodes, but it seemed aimed at a younger crowd and it too didn't feature Ford. And, to me, the Indiana Jones franchise had really become all about Harrison Ford. Ford really made Jones come alive, I thought, providing some nuanced performances that few actors can match in any capacity. I didn't fully understand that in 1981, but certainly by the time the third movie came out, I recognized how very much Ford brought to the role of Indiana Jones. I don't think I would've liked the character nearly as much if Tom Selleck had won the role. All of which is to say that, while I deeply enjoyed the Indiana Jones franchise, it wasn't quite as integral a part of my childhood as either comic books or Star Wars. As I sat and watched Crystal Skull, I kept thinking, "Yup, that makes sense." Indy would definitely act older and slightly different by the late 1950s, and would seem somewhat out of place and that sort of bookends the alien thing at the end. And I caught many of the continuity nods to previous stories. (Henry Sr., Marcus, Pancho Villa, etc.) And I got that, despite the title, the story was about Indy and Mutt, so Indy's screen time would be cut compared to previous movies. I caught all of the foreshadowing bits and understood that Spielberg doesn't tend to be subtle with them. And I didn't have a problem when it seemed like Ford was just kind of phoning it in. (To be fair, though, even when Ford phones it in, he's still a better actor than most of what Hollywood has to offer.) I saw all that, processed it, understood it, and came to the conclusion that it was an okay movie. It's not going down as a favorite of mine, but it was okay. I pulled out Temple of Doom. First time I've watched that particular movie in several years at least. It was generally considered the weakest of the first three movies and I agreed, but mostly on some vague notion of it having sequelitis. From an effects perspective, it's obviously a lesser movie than Crystal Skull. I mean, there's over 20 years of technological advances between the two. Watching the two in close succession really highlights that. But more significantly, the story doesn't make much sense. It's pretty much just an excuse to run from one action scene to another. I mean, why the hell is that ceiling-lowering spikey room there in the first place? And why would you put the activator switches for it INSIDE the room itself? Harrison Ford and Ke Huy Quan turn in some solid performances, and have some good interplay, but story-wise there's barely anything coherent there. The plot with the Sankara stones doesn't make sense at all, and the slave children seem to be an incidental concern to all of the protagonists. And that's when things began to click for me. I mentioned earlier that I enjoyed Temple of Doom when it came out. Certainly well enough to read the novelization of the movie. But two decades later, I spent most of the two hours noticing all of its flaws. A film that I had some nostalgic attachment to. By contrast, Crystal Skull was a movie I had minimal attachment to (just two of the characters, really) but spent more time simply enjoying on its own merits. This tells me that they're not necessarily changing the comics I used to enjoy, but my tastes have changed. See, Temple of Doom hasn't changed; it's still the exact same movie I enjoyed as a kid. But the veneer of... whatever veneer I might have placed on it back then has worn off, and I can see the movie for it was and is. And it's NOT a movie made for a 37-year-old Sean Kleefeld. Neither is Crystal Skull but for different reasons. Seeing Crystal Skull, I could recognize that it wasn't made for me. But Steven Spielberg and George Lucas have aged, and they are necessarily going to make different films than they did 10 or 20 years ago. I can't definitively say that I would've liked Crystal Skull any more or less if I had seen it in 1984. But Temple of Doom was made in 1984. I saw it in 1984. I liked it in 1984. The movie was made, effectively, for people like me. Or rather, people like who I was in 1984. Because the person I am now didn't especially care for it. This is significant because I've never been able to look at comics in quite that same light. I've been too close to them for far too long for me to look at them that objectively. I'm always going to have SOME emotional connection there. So I'd never been 100% convinced that the superhero comics I spent so much of my life reading had changed, or had I? I can still go back and enjoy my old Fantastic Four comics, but I can't remove enough nostalgia from them to adequately compare the reactions I have now to ones I had when I first read them. There's nothing wrong with nostalgia over comics, of course. But you can't see the same story over and over again, and expect to have the same reactions over and over again. What I'm looking for in comics these days isn't what I was looking for two decades ago. While I knew that, what I didn't fully understand is that that is the really the only reason I'm not keeping up with Marvel comics any more; they haven't necessarily changed the stories they're telling, I'm just looking for something different. It's not you, it's me. Heh. I remember when (on probably the 14th viewing or thereabouts) I sat through Indiana Jones and the Last Crusade and, similarly, began to realize that the bare plot was not only rather silly, but of a questionable logic. Of course, I concluded that it doesn't matter, and gained a new appreciation for how the story moves from one scene to the next through an action-driven momentum, leaping right across any gaps in plot logic.